The Original! Chromium plated for excellent tone and durability. Contour design for comfortable fit and precision control. 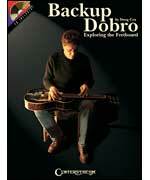 A step-by-step method by two noted Dobro authorities. This method takes the student through the basics of bar position, right hand technique, producing harmonics, and minor and seventh chords. Features 25 solos in G tuning, written in notation and tablature.